Last Saturday, Los Angeles Kings defense man, Drew Doughty, was punished by an open ice by Zac Rinaldo of the Phildelphia Flyers. Doughty returned for a shift after the hit, but was later ruled out for the remaining two periods of the game. A day later, Doughty was placed on the injured reserve list, were he will remain until at least this Saturday, due to an upper body injury. Voynov played in all of the Kings' exhibition games, where he was paired with Willie Mitchell, and saw a good amount five-on-five ice time and on the power play. Voynov accompanied the team on their trip to Europe to start the season, but was notified that he would not be on the opening night roster and returned to the Kings AHL affiliate, the Manchester Monarchs, the day before the Kings' first game. The Kings went through the next week with their roster and Voynov did his thing in a Monarchs jersey. Then Doughty crossed the Flyers' blue line with his head down. 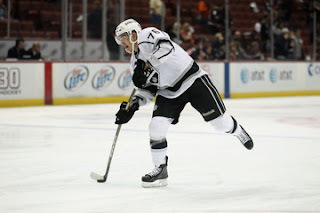 The same day Doughty was placed on the IR, the Kings called up Voynov from the Monarchs. Voynov had only played two games, and racked up one goal, one assist, and was a plus-5 before getting called back up, just in time for the Kings home opener. Voynov was again be paired with Mitchell. At the end of the Kings' 5-0 win over the St. Louis Blues, Voynov had the Kings' third highest time on ice with 19:48, 2:34 of which was power play time, behind only Mitchell and Jack Johnson and was a plus-2. In Doughty's absence, Voynov will be able to re-establish his name in the minds on the Kings players, coaches, and fan base. The fact that Voynov is being relied upon as much as he is can only mean good things for his future. If Voynov continues his productive play it will be twice as hard for the Kings' front office to send him back to Manchester a second time once Doughty returns.